Shi'ite paramilitaries have already played a central, if controversial, role alongside regular army units in recent months in the Iraqi government's first major successful campaign against Islamic State fighters, helping to capture Saddam Hussein's home town Tikrit on the Tigris River north of Baghdad. So far, however, the government has avoided deploying the militia in the Euphrates River valley province of Anbar west of the capital, a vast Sunni tribal homeland that strides the main routes to Jordan and Syria. Baghdad considers Anbar the next target in its campaign to retake territory from the militants. But with the army advance having faltered, officials are now speaking openly about dispatching the militia, organized under the umbrella of "Hashid Shaabi" - "Popular Mobilisation". Baghdad-based analyst Jasim al-Bahadli, an expert on Shi’ite armed groups, said deploying the Hashid Shaabi to Anbar would make both military and political sense for Abadi. "Excluding them will have undesired consequences and give an opportunity for the Hashid to show clear opposition to Abadi’s government," Bahadli said. "That is the last thing Abadi needs." Hadi al-Amiri, a Shi'ite lawmaker who heads the most powerful armed faction within the Hashid Shaabi, dismissed the objections and said he had a mandate from eighty Anbar tribal leaders to join the fight in the province. "We will fight in Anbar without waiting for permission from anyone," Amiri told state TV on Wednesday. 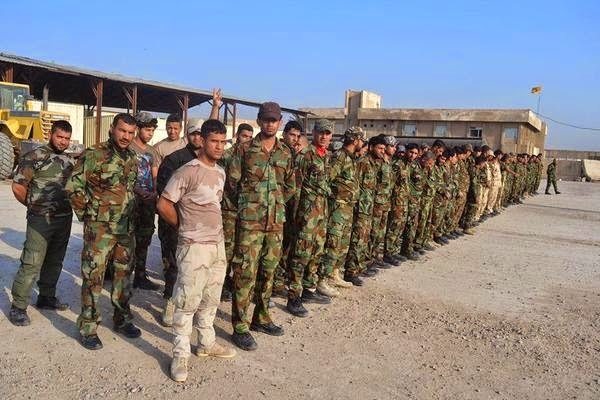 "We will go, not as a favor, but as a patriotic, ethical and religious duty towards our people in Anbar." COMMENTARY: There had been enormous political pressure on Prime Minister Haider al-Abadi, wedged as he was between competing U.S. and Iranian interests during the Battle of Tikrit, with a battlefield victory deemed politically essential. That level of pressure is again on the prime minister, in addition to the pressure being applied by ISIL at Anbar. Following the recent Salahaddin military campaign and the command dispute between Iran and the United States, it was reported another dispute arose between Iraqi and the American military leadership over the next objective in the war against ISIL. Iraq (and Iran had) wanted Anbar to be the focus of the next military campaign, while the United States preferred Nineveh. With ISIL having managed to regain the initiative and the the Iraqi Army facing difficulties in its push at Anbar, the assistance of Iran-backed forces now appears being contemplated. This week Iraqi Defense Minister Khalid al-Obeidi publicly stated he’s received multiple requests from politicians and tribal leaders to send in the Shia militias. Meanwhile there's been a noticeable uptick in reported U.S.-led tactical airstrikes being flown against ISIL targets in Iraq. Everybody stands to loose if ISIS is given the chance to make further progress. If it requires a joint effort by all anti-ISIS military factions to defeat ISIS, then so be it. I thought Iran was already doing that. Too much of that, actually. That's how religious wars begin. Easy to start them, very difficult to stop them. But you earlier explained that the ksa has the right to intervene if others want to make their own 'caliphates' at the ksa's borders and threaten it with claims to share a power.